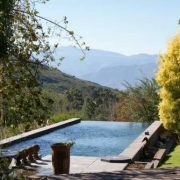 Hebron is a multifaceted farm near Citrusdal at the crest of the Piekenierskloof Pass in the Western Cape, South Africa. 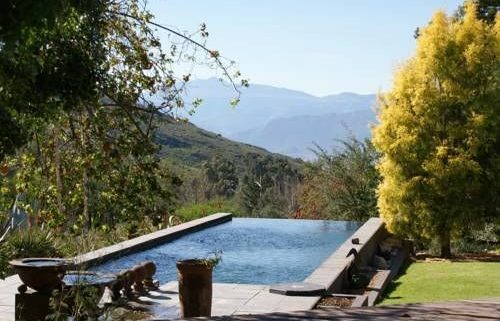 The farm is only 2 hours north from Cape Town. It is a flower farm harbouring a guest house, a restaurant, wine and tea tasting and sales room, as well as a farm stall selling farm products. The accommodation, food as well as hospitality is simply exceptional. The restaurant and wine and rooibos tea tasting and sales room is open from Tuesday to Sunday, 09:00 to 17:00. In addition, it is open for dinner on Wednesday and Friday evenings. Other meals can in fact be organise by prior arrangement. 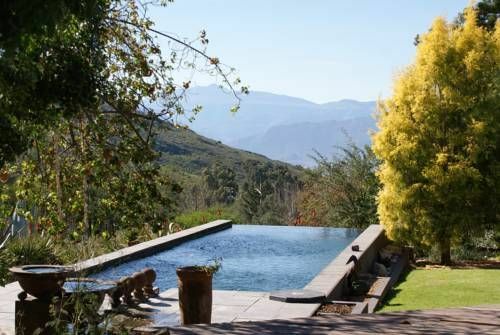 They offer delicious wine and rooibos tea tastings, the best of the Cederberg, combined with food pairings. The à la carte restaurant serves food prepared with fresh ingredients and home made delicacies. They make use of organic products produced on the farm such as fruit, vegetables, eggs as well as milk and more. Furthermore they make their own jams and marmalade. They also offer delicious breakfast, light lunches and gourmet pizzas which can be enjoyed inside or out on the shaded veranda. Breakfast could include bakery such as muffins, scones and sandwiches, home made granola as well as yogurt. For lunch they offer various dishes to choose from such as salads, burgers, pickled fish, chicken, beef and pork as well as calamari and fish. Also mouthwatering deserts such as baklava, flour-less chocolate cake with cream and home made waffles. Then of course fresh coffee in various ways, rooibos or other kind of tea and cool-drinks. Also fresh-pressed orange juice as well as soft drinks and Cedarberg Aqua bottled water. Tant Dollie’s farm stall is open all week from 10:00 to 16:00. There they offer various home produced organic farm products such as jams, chutney, biscuits and gifts. There is also a guest house with 6 Bed & Breakfast (B&B) rooms, each with a private bathroom and amenities included. One of these suites is a self-catering unit. Hebron is ‘n multifunksionele plaas naby Citrusdal. Dit is ‘n blommeplaas met ‘n restaurant, ‘n wyn en rooibostee proekamer en so ook ‘n plaasstal genaamd Tant Dollie se Huis. Die à la carte restaurant en so ook die proekamer is oop van Dinsdag tot Sondag 09:00-17:00. Hulle bied ontbyt, middagetes en heerlike drinkgoed aan. Organiese plaasprodukte word gebruik om die kos van te maak. 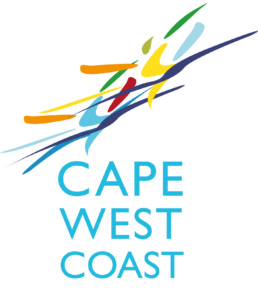 Die beste wyne en rooibostee van die Cederberg word bekendgestel en te koop aangebied. So is daar ook die plaasstal wat elke dag oop is van 10:00-16:00. Daar verkoop hulle ‘n verskeidenheid van plaasprodukte soos konfyte en blatjang en so ook koekies en geskenke.